Although the history of the art of classical ballet in Turkey goes back only as far as 43 years ago, according to the evidence that we have, classical ballet shows in our country date from about two centuries before our age. In 1924, on the occasion of a festivity in İstanbul a classical ballet show was organised in which the Turks participated not only as spectators but also as dancers. As far as established ballet activities concerned, we may quote as most noteworthy the efforts of Guiseppe Donizetti (Donizetti Pasha), who was "The General Superintendent of the Ottoman Military Bands" during the reigns of Mahmut the Second (1784-1839) and Abdülmecit (1823-1861). Donizetti, who was invited to İstanbul in September 1828; introduced the principles of the classical western music as well as some samples of operas, operettas and ballets, to the Ottoman Palace and thus played the leading role in the adoption of these in our country. The beginning of the ballet activities in Turkey fitting the real sprit of the world ballet took place towards the end of the 19th Century. Particularly distinctive was the Naum Theatre in Beyoğlu (Pera) which put on performances with Güllü Agop, Concordia, Amphi, Variete, Tepebaşı and Verdi, all of which arranged the earliest ballet performances by bringing in ballet groups from Italy and France and providing access al citizens. These shows in some cases were identified directly as "ballet" and in other cases as "footwork" in the advertisements and newspaper notices. Lydia Krassa Arzumanova, a ballet teacher who migrated to Turkey with her other fellow White Russians after the 1917 Revolution in Soviet Russia, opened a ballet studio in İstanbul in 1921. She realised hen first demonstration in the theatre "Casa d' Italian" at Tepebaşı with the dancers that she had so far trained. The same group presented the ballet entitled "A Forest Tale" in 1944 on the Ankara Halkevi Stage, whose music was composed by A. Adnan Saygun and choreography designed by Arzumanova. The young Turkish Republic, in the meantime, was advancing day by day, taking huge steps forward and there was a great progress as far as the reforms were concerned. In this connection, as the Republic began to attach importance to fine arts on the western model, a State model, a State Conservatoire was established in Ankara. In spite of the fact that, the authorities thought of embodying within the State Conservatoire also a Ballet Department, and a good deal of work was so far done in connection with this project, those efforts did not yield the desired results. It became necessary to wait until the year 1948, for the opening of the State School for Ballet. In 1947, the founder of the British Royal Ballet and also one of the most outstanding the Turkish Ballet. The results which she attained at the end of her work were concentrated on two facts; the superb ability of the Turkish children for ballet and her deep conviction for the creativity of the Turkish artists. In line with this conviction, she opened the first official ballet school with an academic basis, on January 6,1648, at Yeşilköy, İstanbul. At the end of the examination, 11 boys and 18 girls were admitted to the school as its first students and joy Newton and Audrey Knight of the Saddler's Wells Ballet were invited from England for their training. 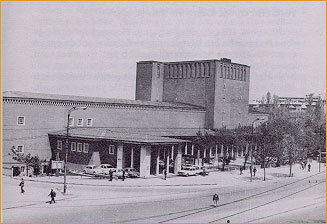 The school moved to Ankara in 1950, and was attached to the State Conservatoire. The first ballet presented by the students of the Conservatoire was "Keloğlan" (1950) on the music of Ulvi Cemal Erkin and with Dame Valois doing the choreography. From that moment on, Dame Ninette Valois, provided a lot of English dancing teachers such as Beatrice Appleyard, Lorna Munsford, Robert Lunnen, Mr. And Mrs. Trevis Kemp, all of whom from the Sadler's Wells Ballet for the training of Turkish dancers. The first graduates, Ayla Dayıgil (Ünal), Meral Öğe, Yüksel Çapanoğlu, Hüsnü Sunal and Geloya Gürelli (Arıoba), instructed by these teachers, completed their training in 1957, after nine year's study. These dancers supervised the ballet courses with Arzumanova and later with other dancers like Güzide Kalın (Noyan), Tenasüp Onat, Kaya İlhan, Orhan Yumak and Engin Akaoğlu who first joined the school in Yeşilköy and afterwards graduated from the Conservatoire, became the first staff of the Ballet Department of the State Theatres. The first performance of the Ballet Department of the State Theatres was Manuel de Falla's "El Amor Brujo" with Robert Harold's choreography. The State Theatres and the State Opera which so far were directed by one and the same management until 1958 were separated from each other in this year. Further on, Dame Ninette Valois sent her assistant Ailne Philip's to Turkey. Philip's with Valois, rearranging the choreography of Lev Ivanov and Enrico Cecchetti displayed the ballet "Coppelia" of Leo Delibes. Hence, a milestone in the story of the Turkish Ballet was achieved. Before then, the ballets could only be a supplementary component of another major performance and were staged to support that major spectacle. The first complete ballet performed in its full version in Turkey with all its artistic devices was Coppelia (1961), who had Binay Okurer and Ferit Akın as the principal dancers. The State Ballet until the year 1990, staged almost al of the great creations of the Classical Ballet Repertoir with the contribution of choreographers who either came from foreign countries or those who were trained in Turkey. On the other hand, our country also took steps, which none the less could not be underestimated, in the field of Modern Dancing. The ever-flourishing desire of Dame Ninette de Valois was the promotion of the Turkish Ballet to a maturity for managing to stand and survive on its own feet and running its own body with all dancers, instructors, choreographers and administrative staff necessary to it. And what exactly happened was that with all its dancers and choreographers who proved their talents on the artistic grounds of Europe, the Turkish Ballet feels the great happiness of having justified this ideal of Valois and swiftly approaches the eventual goal of constituting the Turkish National Ballet.